MRATrack WMS is an economical warehouse management solution with SQL-based warehouse inventory tracking, allowing the use of cordless, portable handheld terminals — in either batch or RF (realtime) mode. Depending on which of the three configurations you choose, the system includes advanced warehouse management capabilities, including directed picking and put-away, cubing, wave management, and cross docking. By adding the 3PL Ebusiness Module and/or Public Warehouse Tariff and Rate Charges Module, you can customize the MRATrack WMS for 3PL or public warehouse use. The Ebusiness Module enables 3PL customers and/or their suppliers to view stock levels via the internet. It can also trigger the delivery of automatic email alerts to the appropriate parties when an order is shipped or a reorder report is run. Via an internet server, a user can display all items provided by a particular supplier or those items within a certain stock category. The item information includes: Item#, Item Description, Current Quantity On-hand, Minimum Quantity Threshold, Maximum Quantity Threshold, and Reorder Quantity. Items are sorted by Item Number, with items below Minimum Quantity Threshold appearing at the top of the list. Whenever a Packing List is printed, an email of the contents of the Packing List is sent to the specified email recipients. Similarly, whenever a Reorder Report is created, a list of the items below Minimum Quantity Threshold can also be sent to one or more recipients. The 3PL Tariff and Rate Charges Module includes two ways to charge 3PL / Public warehouse customers: by storage space over a date range and/or transactions over a date range. Storage rate is calculated based on the average number of cubes stored over a date range. 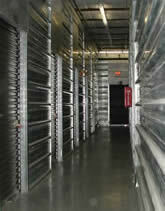 The number of cubes is multiplied by the customer’s storage rate, to give the storage charges for the time period. Transaction fees are calculated based on each transaction type performed for a customer/supplier over a data range. The number of each transaction type is multiplied by the customer’s fees to give the fee for each transaction type for the time period. These modules work with MRATrack WMS in either the batch or RF versions.